Surely you've already seen skyblocks like this one where the primary goal is survival. Do not relax ahead of time and do not think that survival in this place is a very simple matter. You will spawn on a tiny island with a minimum of resources, the island's base consists of only 21 blocks. Looking at the distance you will see a lot of other dissimilar islands. There are chests, villagers and resources that are most important on this map. There are 14 islands with almost the same area. 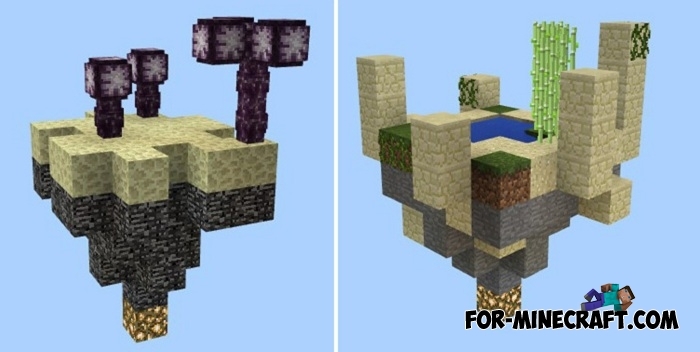 Kidsource Skyblock map for MCPE 1.0.3Kidsource Skyblock is a very small island in the sky with limited resources..